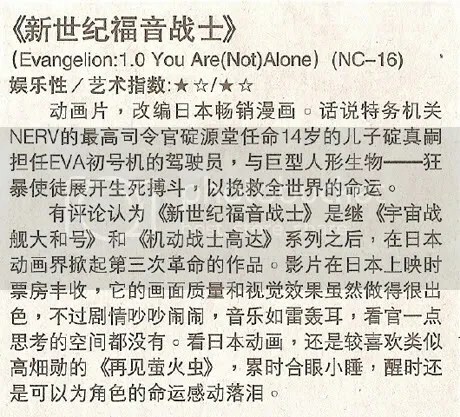 A female reporter from a local Chinese newspaper gave the movie Evangelion 1.0: You Are (Not) Alone only one and a half stars out of five (black means one star, white means half a star) for both entertainment value and artistic value. I will now proceed to write her name inside my black notebook. I can agree with the entertainment value for an average movie watching reporter but I can’t accept the score for Artistic value… Artistic value should be at least a 5 and nothing less. 10 out of 5 is prefered if you compare it to any of the Disney crap. Maybe she never was knowledgeable of anime prior to that? Evangelion must be quite full of randomness for one who never watched the original series, just like watching the last episode of one show without looking at the rest (and of course having no synopsis for hint). Haha, you never know with critics. organizing an angry mob anyone? just give me a call. this ungrateful b*tch, how dare she defile EVA with her heretical thoughts!! she should think herself lucky to be able to catch it. What i would give to be able to watch it…. Darn!! She is ruining the reputation of the movie.. Please, I beg you to right hr name in the black notebook..
squee, one man’s meat is another man’s poison i say. Setsuna-san, not only should she be grateful, she should be thankful as well. most reporters gets to watch movies for free. thus they sometimes take things for granted. Does rottentomatoes.com ring a bell to you? If not, give it a try, you will not regret it. However it’s the North American market. d_blade, ah yes i’ve heard rottentomatoes. it’s one of the best review sites online.